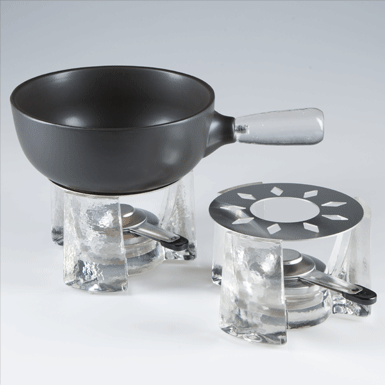 A fondue-caquelon made out of Hergiswiler glass is not possible with glass technology. The ceramic-caquelon with a glass handle has an induction coating and is therefore suitable for induction cookers as well as ceramics, gas and electric cookers. The hand-cast rechaud fits all commercial fondue-caquelons. Includes: Container for fuel paste and cover plate. The handle of the caquelon and the rechaud are poured with 1250° C hot glass into the mold.